This has now become my favorite book! Ever!While reading this book it made me want to go to church because if hell is anything like Jeffrey Thomas describes it, I don't want to be there!I love it! I absolutely loved this book. Let me tell you, though, I don't think it is going to make its Christian readers really happy.The first line in this book is "On my fifth day in Hell, I found a praying mantis." From that moment on I was hooked & pretty much didn't leave the book until I'd finished it.plot summary:Written in journal format, the narator of the story is a recent newcomer to Hell via suicide and because he was an agnostic. But this is not the hell you learned about in Sunday School, folks. As the book opens, our young narrator is just finishing up Avernus University, the starting point for souls newly arrived in Hell. (As a sidebar, Avernus is another name for either the entrance to the underworld or for Hell itself. )After his education, the narrator is released and must roam Hell. He is told about a city named Oblivion, and it is there that he heads. In Hell, the souls all have jobs; they have to pay rent, pay for food, and can even buy prostitutes. There are prisons, jails & cafes there too. On his journey, and during his time in Oblivion, where he rents a flat & has a steady job, he comes to the realization that good and evil aren't so far apart -- that there are compassionate demons & there are sadistic angels. Furthermore, the narrator also realizes that there really is no Satan. Demons yes, devils no. I won't say any more because it would wreck the rest of book.I thought this book was great. I'll probably read it again, since I'm sure that I missed something this time around.I highly recommend it to anyone who likes dark fantasy. This is one of the bitterest and most brilliant explorations of Hell going. The Hell in question is a fundamentalist Hell, not Dante's, and the Heaven that the Saved inhabit is the sort of neon-and-plastic Las Vegas clone that too many of the fundamentalist rank-and-file aspire to. The narrator of the story is a man who died fairly young. He finds himself in a place that is not only merciless, but designed by a sadistic madman with maximum torment in mind, not justice. Struggling to avoid the worst of it, he meets and falls in love with a demoness who, like the other nonhuman residents of this crazy Hell, has a freedom that none of the human inhabitants does. By a miracle, she reciprocates his love, and they run off together, to a part of Hell that is utterly remote from Hell's centers of government and torment. Just before doing so, he wraps up the journal he has been keeping throughout, revealing that he has deliberately mis-identified everyone and everything in the journal so that whoever finds and reads it can't betray him or his love to the authorities. This story is full of intriguing details and unexpected twists and turns, e.g., at one point the narrator is temporarily jailed because he can't produce an ID card, and while incarcerated discovers that he is sharing a wing of the jail with a badly brain-damaged, crazy old man who just might be God Himself, somehow fallen to this low estate. Not a reassuring read, but a marvelous one. Yet another satisfying trip down that particular rabbit hole that leads to hell. A great story and well written in an easily digestible and delightful manner. This author really has the ability to pull you in and paints a very dark and bleak picture of hell, but really entertains with the bits of light that is cast as well. 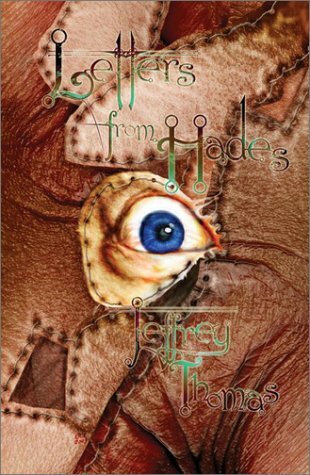 The Hades setting is my favorite of Thomas's, and this is my favorite book in the setting. Like lot of the author's stories, the inclination is to categorize this as horror, but at it's core it's probably best described as a love story in a really, really fucked up setting. Chilling and fun tour of hell. Sacrilegi-delicious!I made the mistake of picking this book as bedtime reading. I barely slept; not for the horror, but rather because I was unable to STOP READING. Ever since I read Larry Niven's Inferno in my early teens, I've been fascinated by books which depict Hell and Demons. Some books that stand out are Larry Niven's aforementioned book, Wayne Barlowe's God's Demon, Anne Rice's Memnoch The Devil,and Piers Anthony's On A Pale Horse.Thus it was with some excitement that I approached Letters From Hades, and the early chapters lived up to my hopes. One enjoyable aspect of descriptions of Hell tends to be the minutiae of environmental detail - Hell tends to be both familiar and horrifically warped and is an opportunity for an author's imagination to run wild.However, the story quickly manages to turn from the fantastical journey of the main character across the landscape of Hell, into the rather mundane surroundings of "normal" city living and employment. I found this really bogged the middle of the story down and killed off the magic; I started dwelling on the inconsistencies and plot holes of how normal life could exist in suc ha place. The relationship between the narrator and the demon Chara develops along an interesting idea but I don't feel it is ever realised to it's potential and lacks depth and detail.The fallout from the rebellion in Oblivion again raises many interesting ideas, but the book ends abruptly without exploring these.I feel Jeffrey Thomas had some cool ideas, but missed so many opportunities to really develop this into a great story with lots of substance. In the end, it was a quick read that felt somewhat glossed over and lacking depth.I would recommend Wayne Barlowe's novel for someone wanting a similar flavour story, but with more depth. A travelogue - 87 days in Hades (read 'Hell' but without Satan. Interesting? Yes - and reminds me that I have other Thomas work to read... (And should probably also have another go at Dante, for comparison).This is the lettered edition (T), leather bound, slipcased with a volume of the illustrations by Erik Williams (and with an additional story by Thomas - The Abandoned), The Art of Hades (no separate ISBN - 74 pages) which I read on June 9. The main volume includes the short story ( 'Coffee Break', rather different) that was the jumping-off point for the novel. Entirely TwistedGives new meaning to that old bumper sticker, "We're Saved. You're Damned." Extrapolated to the nth degree ... Thomas delivers supreme, wonderful surrealism of the very best kind. Jeffrey Thomas - Jeffrey Thomas is an American author of fantastical fiction, the creator of the acclaimed milieu Punktown. Books in the Punktown universe include the short story collections PUNKTOWN, VOICES FROM PUNKTOWN, PUNKTOWN: SHADES OF GREY (with his brother, Scott Thomas), and GHOSTS OF PUNKTOWN. Novels in that setting include DEADSTOCK, BLUE WAR, MONSTROCITY, HEALTH AGENT, EVERYBODY SCREAM!, and RED CELLS. Thomas's other short story collections include WORSHIP THE NIGHT, THIRTEEN SPECIMENS, NOCTURNAL EMISSIONS, DOOMSDAYS, TERROR INCOGNITA, UNHOLY DIMENSIONS, AAAIIIEEE!! !, HONEY IS SWEETER THAN BLOOD, and ENCOUNTERS WITH ENOCH COFFIN (with W. H. Pugmire). His other novels include LETTERS FROM HADES, THE FALL OF HADES, BEAUTIFUL HELL, BONELAND, BEYOND THE DOOR, THOUGHT FORMS, SUBJECT 11, LOST IN DARKNESS, THE SEA OF FLESH AND ASH (with his brother, Scott Thomas), BLOOD SOCIETY, and A NIGHTMARE ON ELM STREET: THE DREAM DEALERS. Thomas lives in Massachusetts.